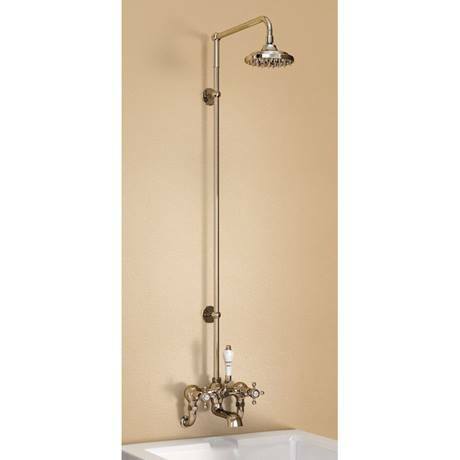 A traditional Burlington Bath shower mixer with Wall mounting unions, Extended vertical riser, Straight shower arm for vertical riser mounting, 6" rose and Anglesey tap handles. Create a stunning period bathroom in your home with the luxury Burlington tap and shower range. Designed for showering over a bath. Complete a stunning classical aesthetic with the Anglesey wall mounted bath shower mixer with rigid riser from Burlington. It blends an idealistic design with a superb structure and build in perfect harmony. The interior is made from brass making it robust and durable, whilst the exterior is finished in polished chrome for a shine like no other.